It is unwise to suggest people-to-people contact as the way to resolve the Cauvery dispute. Makkal Needhi Maiam founder Kamal Haasan’s joint press interaction on June 4 with Karnataka Chief Minister H.D. Kumaraswamy has triggered a huge controversy. He said that the court should be the last resort for dispute resolution and that people-to-people contact should be promoted to find the way forward. Various political leaders says it weaken Tamil Nadu’s case, particularly in a situation where there is a stiff resistance towards the formation of the Cauvery Water Management Authority (CWMA) from the Karnataka Chief Minister. Water being released from the Cauvery for ‘Aadi Perukku’, the monsoon festival in the month of Aadi, at the Mettur reservoir in Tamil Nadu on August 3, 1991. The 802 kilometres (498 mi) Cauvery river has 44,000 km2 basin area in Tamil Nadu and 32,000 km2 basin area in Karnataka. The inflow from Karnataka is 425 TMC ft whereas that from Tamil Nadu is 252 TMCft. Acting on the Supreme Court’s direction, the Centre today constituted a Cauvery Water Management Authority (CMA) to address the dispute over sharing of river water among Tamil Nadu, Karnataka, Kerala and Puducherry. On February 16, the apex court had directed the government to form the CMA within six weeks in a verdict that marginally increased Karnataka’s share of Cauvery water, reduced the allocation for Tamil Nadu and sought to settle the protracted water dispute between the two southern states. The authority would comprise a chairman, eight members besides a secretary. Out of eight members, two each will be full-time and part-time members, while the rest four would be part-time members from states. The chairman of the authority should either be a “senior and eminent engineer” with an experience of water resource management and handling of inter-state water dispute or an IAS officer with an experience in water resources management and handling the inter-state dispute. Ever since the Supreme Court delivered its final judgment on February 16, the situation in both States has been broiling. Although the final judgment brought some initial celebration in Karnataka, it was accompanied by apprehension that constituting the CWMA would be against Karnataka’s interest. At the moment, the CWMA is not fully constituted because three full-time members have not been appointed and there are no nominations from Kerala and Karnataka. The Water Resources Secretary, who is the temporary Chair of the Authority, has indicated that it might take some time before the CWMA becomes a comprehensive body. But the Authority should have been fully formal and functional, according to court’s final verdict, before the start of the irrigation year, which is June 1. If one goes resolutely by the law, the long-pending Cauvery dispute should come to a close after the final verdict and after the CWMA becomes fully and legally functional. But doubts still linger in people’s minds. Therefore, the question is, will Tamil Nadu farmers get water as per the schedule prescribed in the final award upheld by the apex court? It needs to be acknowledged that the Cauvery dispute is the longest and most bitter inter-State water dispute that has been fought post-Independence. It has been almost three decades since the Cauvery Water Disputes Tribunal was constituted. We have gone through a full legal cycle. yet, uncertainty and tension remain in both States. So, it this an appropriate time to initiate people-to-people contact. If we recall, there have been at least a couple of civil society dialogue initiatives in the past (what is regarded as Track II diplomacy). The first such dialogue took place in 1992. It was initiated by S. Guhan, a distinguished civil servant and former Secretary, Finance and Planning, Tamil Nadu government. The meeting was held in Bengaluru and was attended by S. Ranganathan, S. Manavalan and N. Ram. From the Karnataka side, the meeting was attended by H.N. Nanje Gowda, M.D. Nanjundaswami and B.K. Chandrashekhar. It is important to remember that this unofficial dialogue was organised after the declaration of the interim award in 1991, which was followed by unprecedented violence in Karnataka. The total number of Tamilians killed in the 1991 violence was 18 and an estimated 2 lakh Tamilians left Karnataka in a month. Against this background, this dialogue opened up a new chapter in dispute resolution and was appreciated as a positive approach by people in both States. The second civil society dialogue, which I initiated in 2003, followed the eruption of violence in 2002. As an initial measure, two farmers’ dialogue workshops — one in Tamil Nadu (held on April 4 and 5) and the other in Karnataka (June 2 and 3) — were organised. Many prominent people and scholars, besides over 100 farmers and farmers’ leaders from both States, participated in the initial two meetings. After the initial meetings, a committee was formed with 15 members from each State. This committee later came to be known as the Cauvery Family. It had advisers such as Ramaswamy R. Iyer, B.S. Bhavani Shankar, and Gangappa. The Cauvery Family met 18 times in Tamil Nadu and Karnataka, alternatively, between 2003 and 2012 and finally evolved five water-sharing formulae. There continued to be differences of opinion, especially on sharing water during deficit years. The most significant feature of this dialogue initiative was that the members of the Cauvery Family developed a long-term perspective and affirmed their faith in caring, sharing and promoting a feeling of fraternity. What the Cauvery Family could contribute was best described by Ramaswamy Iyer: “The one positive element in this entire unedifying spectacle of State against State and people against people has been the Cauvery Family — a loose and informal group of Cauvery basin farmers from both Karnataka and Tamil Nadu — which is now known internationally. Unfortunately, while it has brought about remarkable mutual understanding and goodwill between the farmers of the two States, it has not so far been able — in spite of several meetings — to arrive at an agreed settlement, including a distress-sharing formula, which can be presented to the Tribunal and the Supreme Court. The Cauvery Family last met in 2012. It did not meet after that due to lack of recognition and patronage from political parties and other official institutions. Curiously, after the 2016 violence and after the declaration of the Supreme Court’s final verdict this year, several people from Karnataka and a few in Tamil Nadu approached me for reviving the Cauvery Family. I took a strong negative position because the legal recourse has taken a full cycle (and it took nearly 40 years) and the stage is set to see the value of the legal route in resolving the dispute. Haasan’s press statement with Mr. Kumaraswamy, advocating people-to-people contact, needs to be seen in this context. He could have waited for at least a year to see how effectively the CWMA functions before making such a statement. Under the present conditions, seeking people-to-people contact for a social dialogue is unwise, untimely and uncalled for. The nation is waiting to see the dispute coming to an end, though not to everyone’s pleasure. At the end of an unusually long three-day meeting, the Monetary Policy Committee of the Reserve Bank of India opted for a hike in key interest rates by 25 basis points — the first such increase in four and a half years. Global uncertainties affecting emerging markets in particular have played a role as well — be it rising tensions over trade wars initiated by the Donald Trump administration or the strengthening dollar or further rate hikes by the Federal Reserve that could strengthen the exodus of global capital from emerging markets such as India. Already, between January and May, outflows from foreign portfolio investors have reached their highest level in 10 years, and by June 4, $6.7 billion was pulled out on a net basis from the domestic capital market. The committee comprises six members – three officials of the Reserve Bank of India and three external members nominated by the Government of India. The Governor of Reserve Bank of India is the chairperson ex officio of the committee. Decisions are taken by majority with the Governor having the casting vote in case of a tie. The current mandate of the committee is to maintain 4% annual inflation until March 31, 2021 with an upper tolerance of 6% and a lower tolerance of 2%. The committee was created in 2016 to bring transparency and accountability in fixing India’s Monetary Policy. The committee is answerable to the Government of India if the inflation exceeds the range prescribed for three consecutive months. The rupee, along with other emerging market currencies, is hurting too, but RBI Governor Urjit Patel dismissed suggestions that the rate hike was a bid to stem outflows. To be sure, while retaining its growth projections for 2018-19 at 7.4%, the MPC has revised upwards its inflation projections for the year since its April meeting — from 4.7-5.1% in the first half and 4.4% in the second half to 4.8-4.9% and a significantly higher 4.7%, respectively. This should worry a government gearing for parliamentary elections next year. Though seasonal food inflation spikes are delayed, input cost pressures have hardened owing to a spurt in global commodity prices, led by fuel. Moreover, inflationary expectations among producers as well as consumers have gathered steam. Crude oil prices have been the biggest factor at play, rising 12% from $66 a barrel when the MPC met in April to $74 a barrel. The committee said this rise is “sharper, earlier than expected and seems to be durable”, and termed it a major upside risk to its earlier inflation projections. Industry has expressed concern, but effective borrowing rates and bond yields had been firming up even before this rate hike. The RBI’s neutral stance, as Mr. Patel pointed out, allows it to keep all options open. But a reversal in rates is unlikely till global headwinds clear up and the mandarins in New Delhi work out a viable strategy to minimise the inflation transmission from global oil prices that is exacerbated by their taxation policy for fuels. UCBs had been facing financial trouble till a few years ago, prompting the RBI to stop issuing fresh licences. But their performance has improved recently while their numbers have come down due to mergers and closures. UCBs currently face regulation by both the RBI and the respective State governments. By turning into SFBs, they will be regulated only by the RBI. The regulator has also allowed all banks to spread their mark-to-market losses (an asset’s value is adjusted on a daily basis to reflect its market price. In other words, an asset experiences a mark-to-market loss if its market price falls from one business day to the next) for the April-June quarter, equally over four quarters. Rising bond yields have resulted in MTM losses for banks. Bond yields and prices are inversely related. Bond yields may harden further as the RBI raised inflation forecast for this year and cited rising crude prices as a source of uncertainty. The latest Sample Registration System (SRS) data indicating the Maternal Mortality Ratio (MMR) has brought glad tidings. As per the data, the MMR (number of maternal deaths per 1,00,000 live births) has dropped from 167 (in 2011-2013, the last SRS period) to 130 for the country. 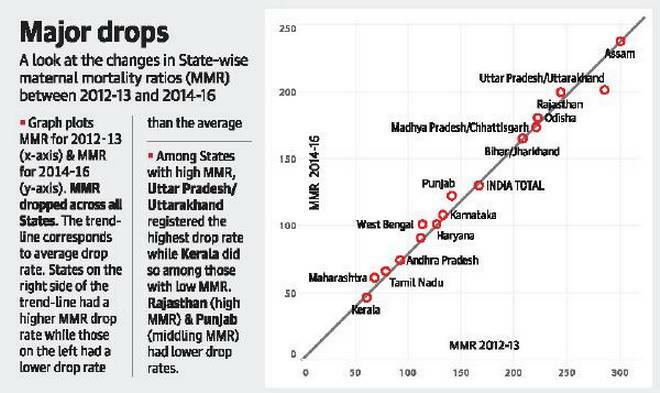 This 28% drop is an achievement arising from painstakingly reducing the MMR in each of the States. Others — the remaining States and union territories. The highest reduction from the last SRS is with the EAG States at 23%, a drop from 246 (2011-2013) to 188, while the Other States have dropped by 19%, taking the MMR down from 115 in 2011-2013, to 93 now. Southern States, which are at a better average of 77, dropped 17%. Truly encouraging is the massive drop of 29% in Uttar Pradesh/Uttarakhand where the MMR has dropped from 285 to 201. Kerala remains at the top with an MMR of 46 (down from 61). Maharashtra retains its second position with 61, but the pace of fall has been much lower, dropping from 68 during 2011-13. Tamil Nadu with 66 (79) is in the third position. India has bettered the MDG target of 139 for 2014-2016 which is the outcome of systematic work undertaken by the Centre and States under the NHM. Three States (Kerala, Tamil Nadu and Maharashtra) have already achieved the UN’s Sustainable Development Goal of MMR 70 (By 2030, reduce the global maternal mortality ratio to less than 70 per 100,000 live births). The facilities in public hospitals and health centers have also improved. The Global Peace Index (GPI) is released by Australia-based Institute for Economics and Peace (IEP). The IEP, world’s leading think tank that develops metrics to analyse peace and quantify its economic value, released the 12th edition of the GPI, or measure of global peacefulness. The Index was first launched in May 2007, with subsequent reports being released annually. Factors are both internal such as levels of violence and crime within the country and external such as military expenditure and wars. India’s GPI rank was 137 out of 163 countries in 2017, when the year 2016 was assessed. India’s rank moved up to 136 for 2017. This is in line with the performance of some of the South Asian countries. Nepal’s rank moved up from 93 to 84, while Sri Lanka’s position moved up too, from position 80 to 67. Pakistan’s rank moved from 152 to 151. South Asia experienced the largest regional improvement in peacefulness, the report noted. However, the best performer of South Asia, Bhutan, slipped from 13th to 19th position, while Bangladesh’ peace index deteriorated sharply. Bangladesh moved from 84th to 93rd position. Peace continues to record a gradual, sustained fall across the world, the report noted. The results of the 2018 GPI find that the global level of peace has deteriorated by 0.27% last year, marking the fourth successive year of deteriorations. Syria remained the least peaceful country in the world, a position that it had held for the past five years. Iceland continues to remain the most peaceful country in the world, a position it has held since 2008. The Constitution (Eighty-Fifth Amendment) Act, 2001, which changed the wording of Article 16(4A). In these cases, the Supreme Court observed that reservation under Article 16(4) — which allows the state to make provisions for “reservation of appointments or posts in favour of any backward class of citizens” — did not apply to promotions. Clause 4B was inserted to ensure that while calculating the quota for a particular year — capped at 50% by Indra Sawhney — the unfilled or ‘carried forward’ quota from the earlier year was not clubbed with the regular quota of that year. The 82nd Amendment Act noted that the Supreme Court had, in both cases ruled that relaxation of qualifying marks and standards of evaluation for reservation in the promotion were not permissible under Article 16(4) in view of the command contained in Article 335. To restore the relaxations, the 82nd Amendment added a proviso to Article 335, allowing “relaxation in qualifying marks in any examination or lowering the standards of evaluation, for reservation in matters of promotion to any class or classes of services or posts in connection with the affairs of the Union or of a State”. The 85th Amendment noted that the SC judgments had affected the interests of SC/ST employees “in the matter of seniority on promotion to the next higher grade”. The amendment introduced the words “with consequential seniority” after “in matters of promotion” in Article 16(4A). The petitioners argued that the four amendments were aimed at reversing the judgments in Indra Sawhney and other cases, that Parliament had arrogated to itself judicial powers, and had, therefore, violated the basic structure of the Constitution. Also, even if the State has a compelling reason it will have to see that its reservation provision does not breach the ceiling-limit of 50% or obliterate the creamy layer or extend the reservation indefinitely. Such a highly exceptional iconographic form of Lord Siva had not been discovered so far. The sculpture belongs to early 7th century Chalukyan School of Art. The vertical stone slab prominently illustrates Siva and Parvati. The Lord is gracefully seated on a pedestal with the left leg on the seat, the other with knee bent and resting on the ground. Two locks of hair falling over his shoulders, he wears neatly entangled hair with a protrusion over the left of his head and knotted in a mountain dweller fashion.